Shower Radio with Wireless Caller ID | OhGizmo! I never have a problem with phone calls that inconveniently come while I’m in the shower because quite frankly I can never hear the phone. However for some people with extraordinary hearing, or ridiculously low water pressure jumping out of the shower to answer the phone can be a nuisance, especially if the call is unimportant. For those who really need to know who’s trying to get in touch with them while in the shower this combination Radio and Wireless Caller ID will probably do the trick. While listening to the weather and traffic reports you can also keep an eye on who might be calling you. The caller’s name and number is displayed on the unit’s LCD screen which connects wirelessly to the caller ID box attached to your phone line. And if you’re the type who enjoys a really long shower the unit will store the name and number of the last 10 callers. 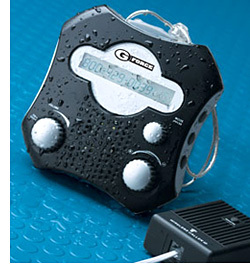 The Shower Radio with Wireless Caller ID is available from Gadget Universe for $49.95.